“Anything Is Better Than Nothing” is a premise for this easy to follow fitness plan. Start now with 5-minute chapters that can change your life. It’s flexible, fun and easy! The main concept of this easy to read self-help guide: Anything Is Better Than Nothing. It works! Lynnworth’s plan for improved fitness includes 1,000 photos you can follow without even reading the details. 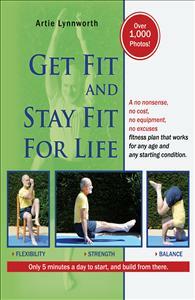 Alternatively, specific instructions for each chapter’s brief workout routine targets balance, flexibility and strength. No equipment is needed and all can be done at home. Any starting condition is okay, since exercises range from those done in a chair, for the elderly or beginners, to advanced gymnastic and martial arts movements (headstands, handstands, aerial flips and rolls). Start now to improve your health and fitness for life. What a amazing book! It is so easy to follow the guidelines and go step by step to feeling much better. Anyone can follow the instructions along with the photos. This book is for anyone who wants to improve their body-tone and feel better after doing the exercises at their own pace.